Briefly describe your role and how you learned about the organization. "I was offered a position within Axalta's Rotational Program as a Marketing Specialist. I will be relocating temporarily to Tyler, Texas to work on the integration of a company we recently acquired. Prior to my full-time role, I worked as an intern and part-time employee for Axalta Coating Systems. I found that opportunity through LinkedIn." How did interning and working part-time at the organization help launch you into a full-time role? "Interning within this industry helps with the transition to and knowledge needed for a full time role. The paints and coatings industry is a niche industry and not something a person has exposure to in the classroom, without a chemical background. The internship program at Axalta recognizes this, and offers its interns many opportunities to visit laboratories and production plants, as well as educational sessions on the industry. The leadership at Axalta are industry experts and having exposure to those people not only helped me to learn quickly, but also allowed me to build mentorship- like relationships to continue my learning throughout my career." What was the interview process like for your full-time position? "I went through a phone interview and then an in-person interview for this role. During my in-person interview, I not only interviewed with a representative from Human Resources, but interviewed with a member of the leadership team as well. Accessibility to leadership is something that stuck out to me about this organization and is something I have come to value." 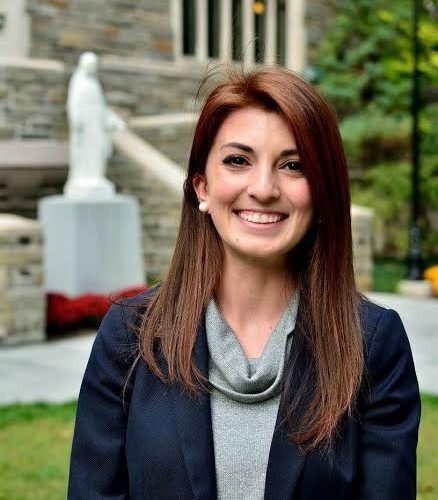 "Having a Jesuit education taught me that our education will not only serve ourselves, but the world around us. I wanted to work for a company that understood its impact on the world as well as put an emphasis on relationships in the workplace, with customers, and in our communities." "While at SJU, I completed two internships, one with the Economics Internship Program - Department of Commerce and the other with Axalta Coating Systems. I also did a study tour to Spain and took a service learning course called Economics of Poverty and Income Distribution"
What advice do you have for SJU students who are looking for internships or jobs? "I would encourage current students to be open to applying anywhere that fits their skill set. We are often drawn to well known names and often the best opportunities are the ones that aren't the most popular. Don't be scared to work for a company you know little about or work in an industry that is unfamiliar to you. Learning something new daily is what keeps things exciting in the workplace."